Shuttlebirds has started their Wednesdays Weekly Challenge after a hiatus of 4 years. I didn’t have a clue at the time, but when it showed up in my blog roll, I couldn’t stay away. 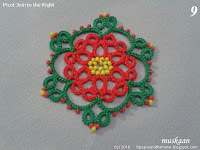 Nicola’s patterns are always a treat – to see, to follow, to tat. 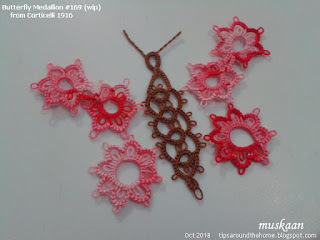 And even though I’m no fan of tatting animals (except birds, butterflies, & bunnies) tatting long shapely chains are always a challenge. As always, the images, notations, and instructions are very clear. However, for shuttle tatters, one needs to choose which shuttle to work with, when to switch shuttles and with which shuttle to make the lock join. I sewed in 2 black beads for eyes later, though they can be pre-strung. For the right armpit, I didn’t make the lock join with other shuttle. The ‘twist’ is glaring! I was so focused on the stitchcount for the long tail that I forgot to snug the stitches more compactly. Long chains are not easy to control or hold shape, but I’m fairly happy with how these turned out. It is a very cleverly designed and executed pattern and wish my monkey was more perfect. I went through the list of previous challenges and chose the very first one. This butterfly has been flying around pinterest for ages and I first made it in 2013, before I started blogging. Not satisfied, it’s been in one of my to-retat boxes (don’t remember which one – I need to ‘organise’ a massive hunt!). The link on the site doesn’t work, but a quick search through pinterest will throw up the pattern. This is the one I followed (from a Russian book). It is a beautiful butterfly within butterfly design, tatted in one pass! In Anchor & Lizbeth size 40, the butterfly is 2” high with a wing span of 1½”. Knotted the 2 threads together and worked a lock chain for first antenna, then worked the 4 inner rings as mock rings separated by an unflipped 2nd half stitch to secure. I had earlier started with normal rings but horrors, the thread broke while closing the last ring. In the 2nd round SLT is used to keep the chain and rings of same colour. 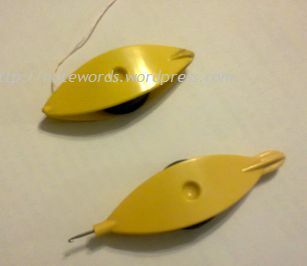 Ended with the 2nd antenna, knotting and snipping off ends. 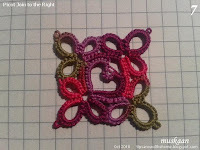 I tweaked the stitchcount on the lower wings (outer round) to get this shape. Trying to play with colour combinations, though I’m not too happy with the pink shade. 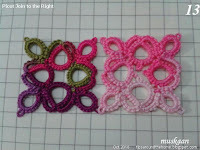 This old butterfly from 2013 is worked in South Maid size 10. Normal rings instead of mock rings. And it is missing an antenna. Will tackle it when I find it, and update with the dimensions. As beginners some of our first shuttle-only flowers and butterflies have free rings – a cluster of closely tatted outward facing rings. 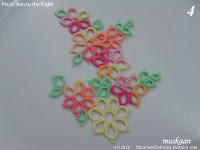 The next stage is when the adjacent petals are linked through picots and we learn the picot join. 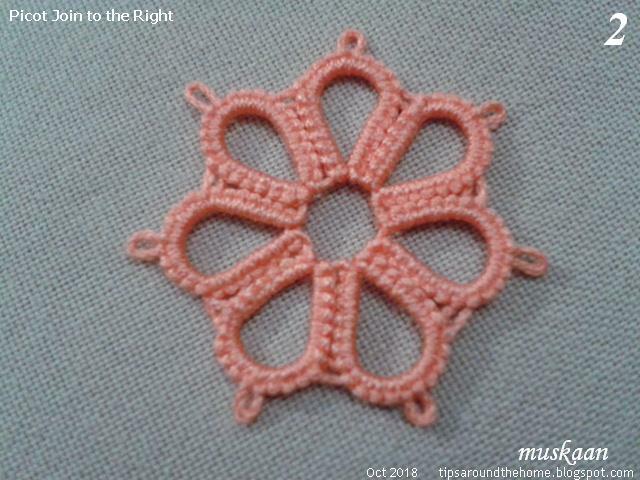 Easy - the joining picot is to the left of current work. 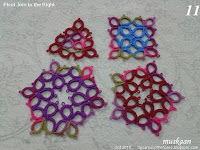 And then comes the last petal/ring (7th ring in fig2) and we have to join it to the first ring. Huh! How to link it to the first petal?! 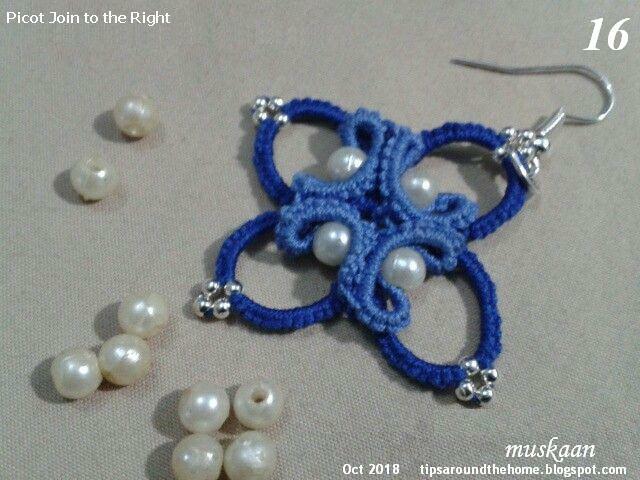 How to reach through that picot without ending up with a twist or with a locked/snagged core thread? the linking picot is to the right of the element being worked. 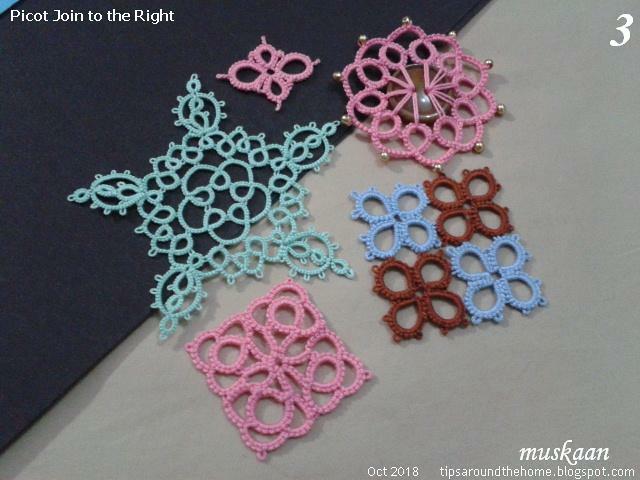 A great deal of tatted lace returns to the starting point before tying and cutting ends or climbing out to the next level. 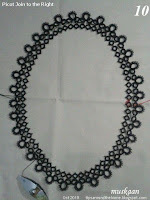 It could be a motif, medallion, doily, or even edgings on a fabric. Sometimes this linking back is through a picot on the first element(s). Google any of the bold terms for an array of tutorials (add ‘tatting’ to the term). Some resources are listed here. 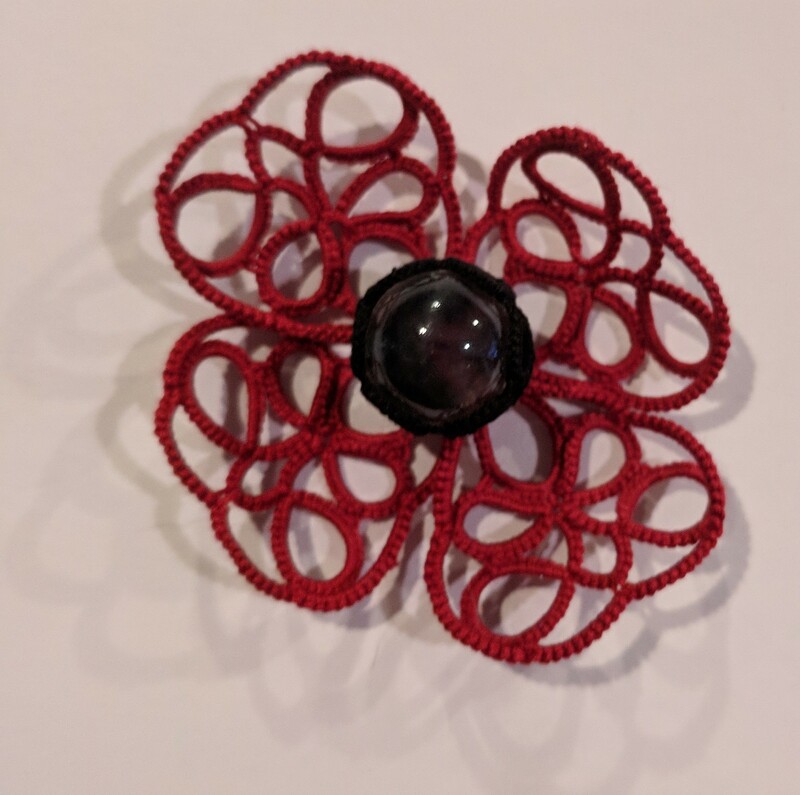 Last to First Join refers to this aspect – the last element linked back to the first element through a picot. It can be between 2 rings, 2 chains or a ring and chain. Most frequently we apply this linkage to close a medallion in a circle. Joining in a circle/in the round is another term for this final linkage arising from traditional medallions before the invention of the tatted chain. Medallions made of a cluster of linked outward facing rings were commonly called a rosette or flower (fig2). 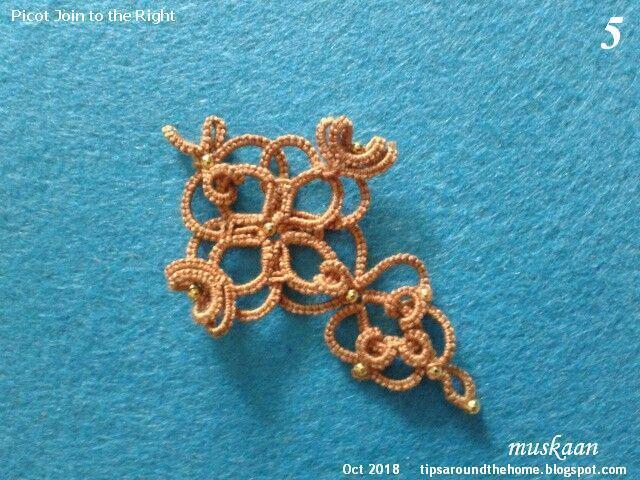 Hence Mary Konior also called it the Rosette Join. 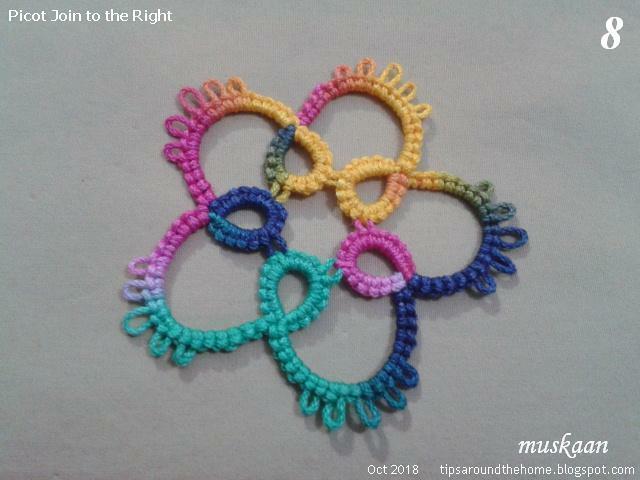 As frequently mentioned, it is not just difficult to reach that joining picot, but there is a tendency for it to twist after linkage has been made. The following terms are based on the movement required to make that linkage. Twisted picot join – where the picot is pre-twisted before pulling a loop through it for linkage, thus pre-empting or neutralizing the twist when completed. 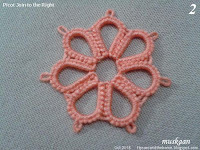 Folded Join – where the work is folded in such a way as to reach that ‘pesky’ picot. Avoiding the Folded Join – a simple reorientation or rotation of work results in avoiding any folding or twisting by bringing the linking picot to the left of work. Riego Join is yet another term (coined by Teri Dusenbury) referring to the same join found in Mlle Riego’s books dating back to the 2nd half of 19th century. A long tail is cut, slipped through the picots, and the last ring is finger-tatted. Thus the linkage is made Before the ring is tatted. The above list seems to suggest a fairly small range where this join to the right comes into play. Not true! The following tatted models show us numerous circumstances where we have used the ‘right’ picot join. 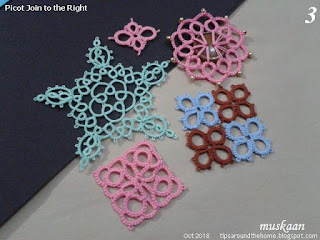 And to make it playful, try identifying that join to the right in each medallion or motif (click on image for larger view or on blue link for respective post). Only single or a cluster of rings? 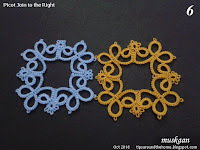 Rosettes have very closely placed single rings. 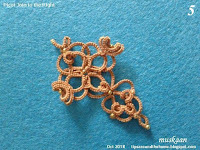 However, a larger, more open medallion, or an edging, when joined back on itself, may need the same join. Does the join come into play only with outward facing rings? Not at all, though most resources tend to focus on rosettes. 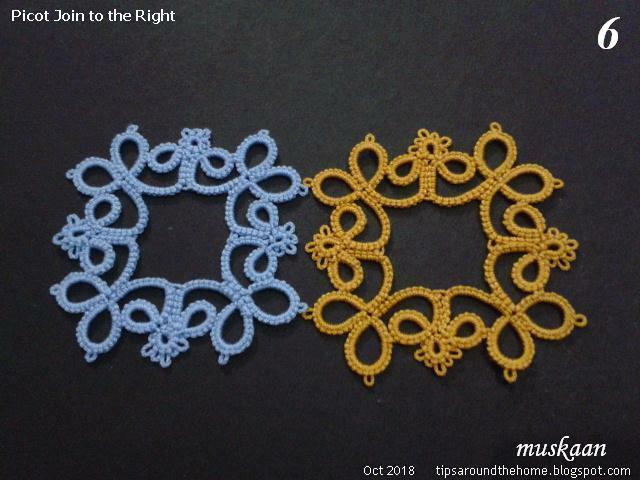 The following examples have inward facing rings, but need to join the last ring to the first through the picot that is on the right of current work (fig8). Not just single, but multiple rings can need the join! And not just one but more linking picots within the same element may be involved. The vintage edging with bare thread space has both inward and outward facing rings and since it is closed, the starting rings were on the right of the final rings (fig10). In the Quatrefoil medallions the number of inner rings reflect the overall shape of the polygon and the rings are bridged by split rings (ie. we move from one inner ring to the next via a split ring instead of bare thread or chain). Each of these needs the join for both the inward & outward facing rings (fig11). Does the join occur only between rings? 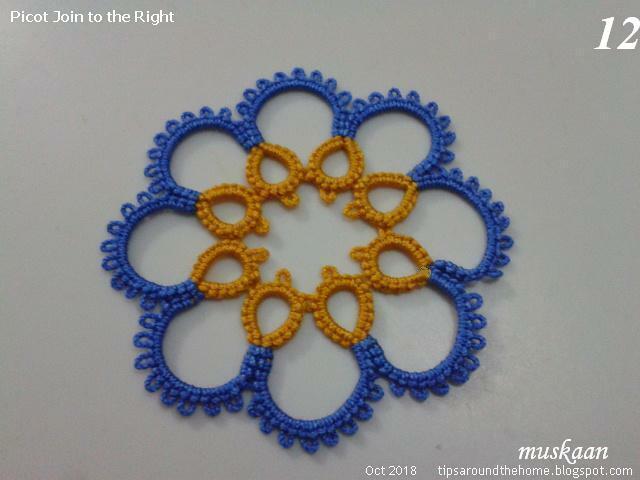 In this medallion, the linkage takes place between the inner yellow rings as well as the first and last blue chains (fig12). 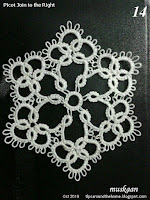 Why stop at only 2D tatting? Tatting around a button, cabochon, gem, shell, doodad, may all end up with a last picot join to the right. 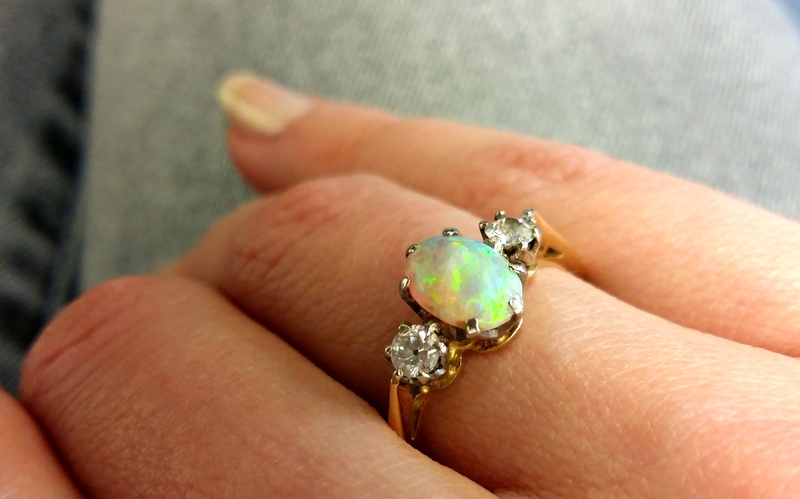 Whether around a button, or around a gem for a ring, the final inward facing ring clearly needs to be joined back. The popular Ice Drops require the join both on the front and back. And even the final curled ring is linked back around the shell. (fig15). 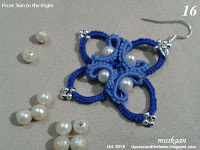 In the ANKAR-style earring not just the large blue rings, but the curled rings also need the picot join to their right (fig16). Is it always the final/last join? In both the part 1 & part 2 pictorials, as in majority of tutorials, the thread(s) end up at the front/above the work. It does not matter as usually the work is ending and after the threads are snipped off, the tails can be repositioned as desired. But there are patterns where one may need to continue further and hence both threads need to be on the same side - either at back of work or in front - as in the Curly Cross pendant (fig5) or this 3D flower (fig17). 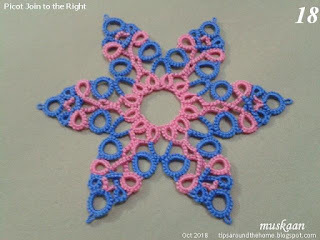 In the one-pass snowflake, ‘Celeste’ (fig18), each arm has rings that need to be linked to their right, and work continues! So ‘last to first’ is no longer applicable! I hope these projects provide a glimpse into the diverse usage of the join to the right, and why a generic term like ‘picot join to the right’ is more applicable than the smaller windows provided by other terms. Nevertheless, whatever term (or movement) is used, one should now be able to identify with ease, where and when the ‘right’ picot join is required. No more scratching one's head even if the pattern instructions do not specify it !!! I’ve been pretty lethargic these last few days – picking up the shuttle and/or Cluny loom for short durations only. Reading, watching tennis, and now housecleaning (Not my favourite urge, mind you) seem to occupy my time more than my passionate urge to tat. Oh, and I fought my urge, staying completely off the grid for a couple of days - detox, perhaps? But I couldn’t resist the urge to tat this latest from kukkatatting! It’s her 94th scmr medallion and I love the picot flowers all around giving the snowflake a flurry look. Except for the ones on the tips, the picot flowers are linked to each other, and I missed out one attachment. 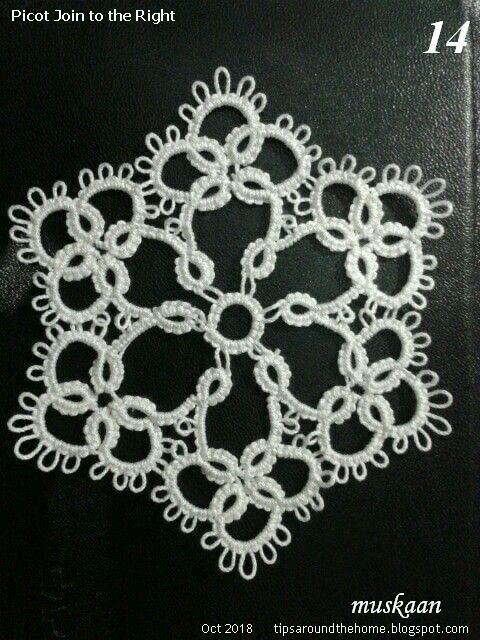 Worked in size 40 thread, it measures over 7cms across. I hope she does not mind me copying her pattern. In case of any complaint, I will delete this post with due apologies. After a few days of musing, here’s how far the Scrappy doily has come. 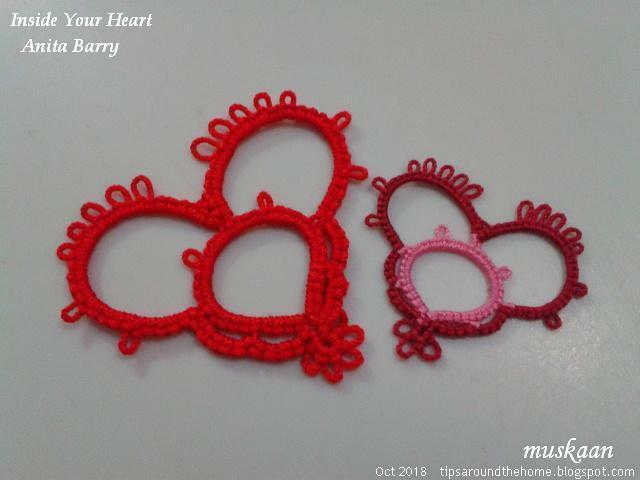 I absolutely Loved all the advice I got (thank you once again, gracious tatters/crafters), and it has guided me in this round so far. I started by sketching an outline of the 4th round (which you may remember was ovoid), and then sketched a couple more lines around it to balance out the asymmetry. And a couple of weeks back I did finish sewing in Jane McLellan's leaf braid edging on to my MIL's saree. I didn't want to end up with all the sewing in one go (blossoms motifs and edging together). This is actually a pic taken much earlier.